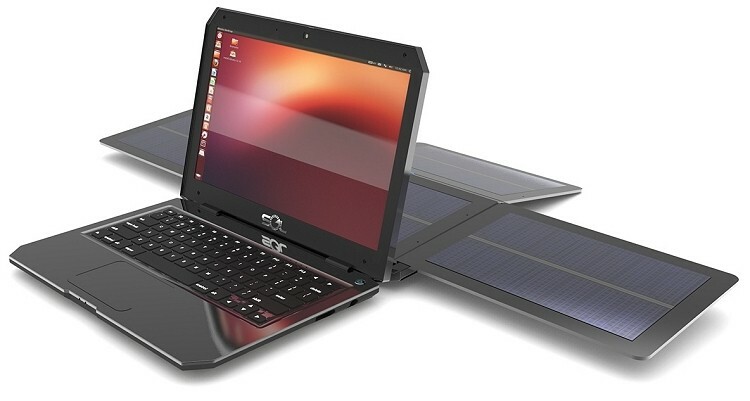 Canadian-based WeWi Telecommunications Inc. has created an Ubuntu-based laptop that harnesses solar energy from the sun for power. The Sol claims to last for up to 10 hours via the internal battery, can run directly off solar energy and can be fully charged via solar power in just two hours. As you might imagine, the notebook is designed to be used in regions or environments where electricity may not be readily available such as in developing nations, the military and even certain educational fields. It features a solar panel that can be unfolded from behind the display to soak up the solar energy. It took some digging but I was able to come up with a list of specifications on the notebook. It ships with a 13.3-inch display operating at 1,366 x 768, an Intel Atom D2500 chip clocked at 1.86GHz, options for either 2GB or 4GB of RAM, a 320GB Seagate HDD and built-in Intel GMA3600 graphics. Other features include a 3-megapixel camera, three USB 2.0 ports, 3G/4G radios, GPS, Wi-Fi and Bluetooth. The website does mention that the Sol comes loaded with all the productivity and creativity tools you need, promising there won’t be any other software needed to get started (a pretty ambiguous claim, no?). Pricing is listed at $350 for the base model and $400 for a submersible version. No word on when the company plans to ship as the site simply mentions both models will be available soon.